It all began in a tour of Led Zeppelin – the craftsmen of one of the most popular rock songs of the past 40 years – “Stairway to Heaven”. The audience on the front row were nodding their heads against the rhythm of their music and that was when the term “head banging” was coined. Soon, in the subsequent years, it was popularized by the metal icons like Black Sabbath and Motorhead. Although, the roots of headbanging goes down to the rock music, it has now become an essence of metal music – the dance of the metalheads. The circular head swings of Cliff Burton or the up-down jerkings of Dave Mustaine are irresistible but it’s not just dizziness or post-headbaning sore neck that you may experience. 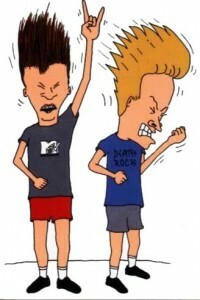 More serious injuries have been associated with headbanging behavior. Even though there are only a few unique cases documented, neurosurgical specialists question whether the incidence rate could be much higher because the symptoms are clinically silent or cause only mild headache that resolves spontaneously. Stroke: In 2005, Terry Balsamo, Evanescence guitarist, experienced a stroke and the doctors believe that the condition occurred due to headbanging. Physical injuries: In 2007, former Moloko vocalist Roisin Murphy suffered an eye injury during a performance of her song “Primitive” when she headbanged into a chair on stage. Spinal problems: In 2009, Slayer bassist/vocalist Tom Araya began experiencing spinal problems due to his aggressive form of headbanging, and had to undergo anterior cervical discectomy and fusion. Similarly, in 2011, Megadeth guitarist Dave Mustaine said that his neck and spine condition, known as stenosis was caused by many years of headbanging. Carotid Dissection and Subdural hemorrhage: Mackenzie, 1991 reported a case of 2 adults who developed Subdural hemorrhage after violently shaking their heads to the beat of rock music. One of them also had a dissection of carotid artery. The German medical journal The Lancet published a study of a 50-year-old man who complained of 2 weeks of worsening headache and was later diagnosed as a case of a “chronic subdural haematoma” following a bout of headbanging at a Motörhead show in 2012. 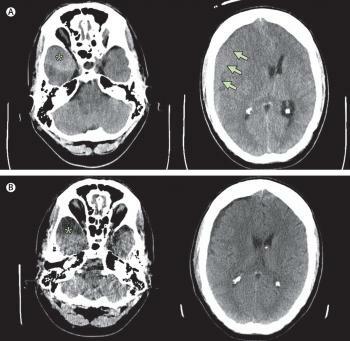 Chronic Subdural Hematoma in a 50 year old Headbanger. Mediastinal Emphysema: Saeko Matsuzaki and the team reported a case of Mediastinal emphysema following rupture of occult bulla in a 34 year old guitarist as a “pseudo shaken-baby syndrome in adulthood”. The patient regularly experienced neck and chest pain after concerts. Vetebral Artery Aneurysm: Egnor MR reported a case of 15 year old drummer in a neighborhood rock music band who suffered a traumatic true aneurysm of the cervical vertebral artery from violent head and neck motion. He underwent excision of the aneurysm after distal and proximal ligation of the artery. Basal Artery Thrombosis: Edvardsson and Persson reported a case of 20 year old musician who presented with neck and head pain and vertigo for 3 weeks. He was later diagnosed with Basal Artery Thrombosis (BAT) associated with head banging. Vertebrobasilar ischemia or infarction as a result of extremes of cervical motion is probably due to the fact that the vertebral arteries are fixed in the transverse foramina, rendering them susceptible to occlusion or shearing from extremes of neck motion.